Jill Barta, for the third time this year, has been named the WCC's Women's BB player of the week. SAN BRUNO, Calif. – The West Coast Conference has named its Women’s Basketball Player of the Week for January 29, 2018. Jill Barta led the West Coast Conference-leading Zags in points and rebounds in both contests over the past week. Against Portland, she posted 21 points and seven rebounds, and two days later she was one rebound short of a double-double at San Francisco with 24 points and nine boards. She led the Zags with three steals at USF and dished four assists against the Pilots. She blocked a shot in each game. On the week, Barta shot 58.8 percent from the field, averaging 22.5 points, 8.0 rebounds, 2.0 assists, 1.5 steals and 1.0 blocks per game in only 22.5 minutes per game for the Zags, who are unbeaten in WCC action. Congratulations Jill. An honor well deserved. Here is some additional information on Jill's award this week. 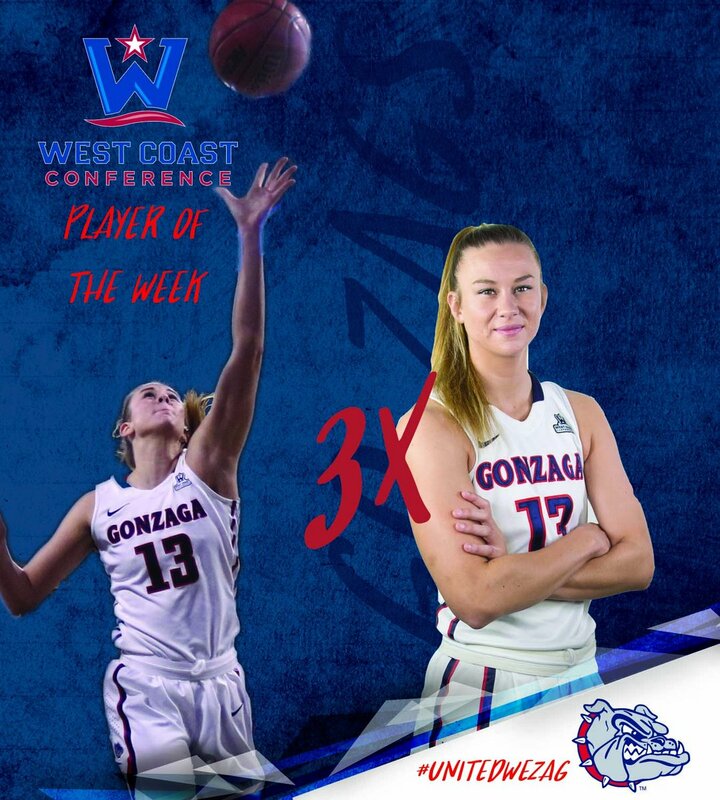 JB winning the Player of the Week award for the 3rd time in a season is the first time a Lady Zag has accomplished this feat since Courtney Vandersloot won the award 3 times in 2010-2011. The Gonzaga record for winning the Player of the Week award is five (5) times by Stephanie Hawk in the 2006-2007 season. Last edited by TerpZag; 01-29-2018 at 05:57 PM.